"This 700 lb weight capacity transfer bench comes with contoured seat and backrest, arm rail support and adjustable height legs." For Disabled Seniors, the handicapped and the elderly Bathroom saftey should be taken seriously. Provides a wide and deep seating surface for those who need extra assistance when transferring in and out of a bathtub. 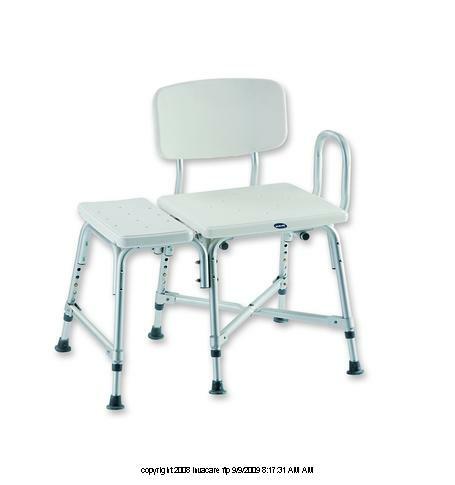 The durable aluminum frame with special cross brace design provides maximum stability for larger individuals. It is important to feel safe and be comfortable in your bathroom or the bathroom needs to come to those at risk of falling and breaking bones or just getting bruised. Seat Width including transfer section: 27"